How do I get my old Chinese language features back??? This is an example of what we endured through the first years of Windows 10. Q: I can't find Chinese features I used in Windows 7! Is there any way to fix this? A: Far too many of the problems of Windows 8 are still with us. In the past, the cure for this sort of thing often came in the form of IME (input method editor) updates released on the same schedule as new versions of Microsoft Office, with Windows language packs or as separate free downloads. But these changes are now only delivered in automatic system updates over which users have very little control. 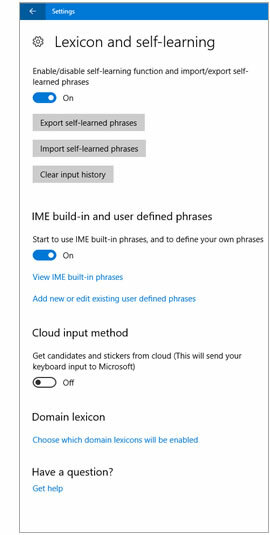 The Cantonese Phonetic IME (CPIME) was added during an automatic system update midway through first year of Windows 10, and the July 2016 one-year Anniversary Update arrived with several new gifts for users of other IMEs. More improvements have arrived with each major release, like the 2017 Fall Creators update, and the April 2018 Feature Update. But many features are still missing, broken, or just plain lame. Below is a list of those I've found. As solutions become available, I will post them under each section below. The desktop Language bar was much improved in the Win 10 one-year "Anniversary Update" (version 1607), released in July 2016. This update finally brought back most of the MSPY language bar tools. You must activate the desktop language bar to display these on your taskbar. As of the April 2018 Feature Update, I've been unable to get all the icons to appear unless I invoke the floating language bar (right-click on "CH", select "Restore the Language bar"). But at least these items are still there. Sigh. • Traditional/Simplified character set button. ("Extended" is no longer an option, and this is a new set of Traditional characters. 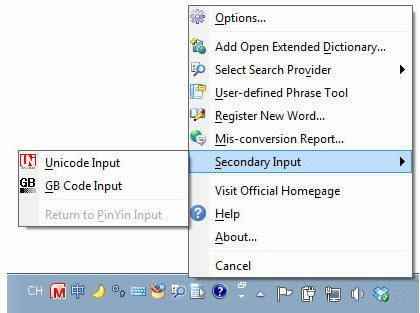 & region" panel, but now jumps you directly to Microsoft Pinyin settings. • In the initial 2015 release: Pinyin entry style (full/double Pinyin), hotkey switching, character sets (see below), personalization (dynamic candidate list ranking and self-learning, which required you to loosen some privacy settings...see below), cloud input (which you may want to turn off, because it sends your input to Microsoft), and fuzzy Pinyin entry rules. 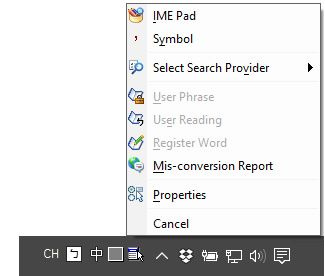 • Added in the July 2016 "Anniversary Update": a "None" option for the Chinese/English hotkey, domain lexicons, user-defined and built-in special phrases, and candidate list width/size/font controls, plus a way to turn on the desktop language bar without going into the old-style ("advanced") control panel. • Added in 2017/2018 updates: many key combinations, candidate list appearance controls, and expanded options for the lexicon and self-learning features. • Still missing from Options: control of the <Enter> key function for composition direct input vs. Pinyin conversion (same as the <Space> key). • Gone forever is the "Extended" character set containing both Traditional and Simplified characters. We have a new GB code Traditional character set, and for the first couple years it did not contain some common "modern simplified" characters, but eventually improved. See below for more information. Is your PRC/Singapore Pinyin Personalization greyed out? Microsoft Pinyin personalization will automatically sort your candidate list based on your frequency of usage, learn phrases from your typing history, and let you import lists of phrases. These features will increase your typing speed. Until a 2017 Update, these options were grayed out when I looked at options for this IME: Settings > Time & language > Region & language > 中文 (mainland or Singapore) > Options > Microsoft Pinyin > Options. In the original release, Pinyin personalization would only work if you enabled Microsoft's creepy "Getting to Know You" feature. When you first install Windows 10, Microsoft suggests that you allow Windows and Cortana to "get to know you": Settings > Privacy > Speech, inking, & typing, and clicking the "Get to know me" button. If you declined, the Pinyin self-learning options was be one of many features that will be deactivated. If you don't like creepy Cortana, you should probably not activate the "Cloud input method". This sends everything you type to Microsoft's library in the cloud. This is a common feature also found in input methods from Sogou and others to help improve their products and in turn improve your candidate list results. They say the data is encrypted in transit and anonymized on their servers, but it is still theoretically possible to evesdrop on exactly what you are typing. I leave this turned off. These features do not work with Traditional Chinese in this mainland IME. If you you need full functionality in Traditional Chinese, you'll need to use Microsoft Bopomofo IME instead, unless cross-strait encoding issues cause technical problems. This self-learning issue is yet another reason why I do not recommend this TC option. The Windows 10 "Anniversary Update" (version 1607), released in July 2016, finally brought back the taskbar button for quickly switching between Simplified and Traditional Chinese character sets. This had been missing since Windows 8! Without that button, we had to dive several clicks deep into Settings > Time & language > Region & language > 中文 (mainland or Singapore) > Options > Microsoft Pinyin > Options > Character set. That control panel setting is still available too. Note that there is one important difference between this feature in Windows 10, and the last release for older versions of Windows. Notice that this version included an "Extended Character Set" that combined Simplified and Traditional. The Extended Character Set is gone, perhaps forever, and without that you may need to switch often due to certain modern simplified characters missing from the traditional set. See the next section to learn why. From Windows 8 through the first couple years of Windows 10, we not only lost the "extended" Chinese character set (mentioned in the previous section), but also had to struggle with a Traditional Chinese character set for mainland/Singapore users that was missing what you might call "modern simplified" Chinese characters. Such characters have long been in common use throughout Taiwan and other Traditional Chinese regions. A major feature update in the fall 2017 or spring 2018 (I did not notice which) finally fixed this. In the example above, originally we were offered only old version of "zhi3": 衹 instead of 只. (This problem was even more frustrating until the one-year "Anniversary Update" was released in 2016, because until then we couldn't conveniently switch between the character sets inside the Microsoft Pinyin IME, as explained in the previous section). Whoever made the original decision clearly did not think through the global nature of Chinese electronic communication. Whether you use this feature to avoid cross-strait encoding corruption, or simply because you like the Microsoft Pinyin input method better than the Pinyin option in Microsoft Bopomofo, you have a right to resent Microsoft pushing upgrades when a key feature like this was not yet ready. The image above shows the input method section of the classic Language control panel for the Taiwan, Hong Kong, and Macau locales. In Windows 10, you won't find Options links for Quick, Changjie, or the Cantonese CPIME at the time of this writing. You'll have to go to the new Settings panel: Settings > Time & language > Region & language > 中文 (Hong Kong, Taiwan, or Macau) > Options. Quick and Changjie options in Settings are extremely limited: for Quick and Changjie you'll only find controls for "Beep" feedback, Associated Phrases, English/Chinese default input, Mode Change Key, and character set choices for Unicode and HKSCS. Unlike the others there is no "Advanced settings" link that would take you to options on the classic Language control panel, because that doesn't exist. Quick users are particularly frustrated with this, as many are used to an older keyboard layout but there is no such option in Windows 10. Cantonese CPIME is greyed out in the main Settings list, as it was licensed and bolted onto the classic desktop (where it lives on the "ZH" button, not "CH"). See this FAQ page for instruction on how to select the Cantonese Phonetic IME. And since there are no Options for this one, you cannot change from the default Jyutping to another phonetic system such as Yale or Sydney Lau. The Help feature is also missing, but I have suggestions on my English-language Help for the MS phonetic IMEs page. At the time of this writing I see no download that officially supports Windows 10 on the CPIME website but those downloads do install in Win 10 (replacing any other CPIME already on your system) so you may want to give those a try. The Tool Menu and taskbar buttons are missing from Quick, Changjie, Array, DaYi, and Cantonese. Also, the floating Software Keyboard is missing. After I installed the Chinese language packs in Windows 10, the system's Search feature became semi-bilingual, but mostly just bipolar: control panel results are in Chinese, and Settings results are in English. 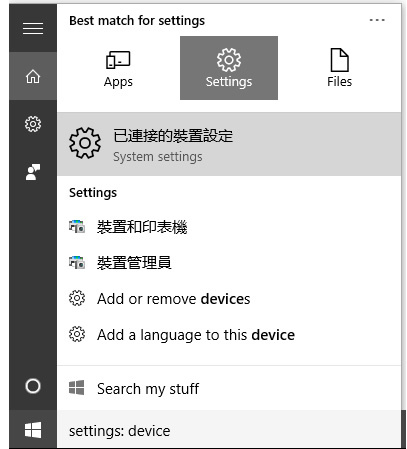 In this example, while in the English display language I got Traditional Chinese and English for different items: the control panel "Devices and printers" is 裝置和印表機, and "Device Manager" is 裝置管理員, but the Settings items like "Add or remove devices" are in English. If I narrow this search to only "device manager", I get only the Chinese language results for that control panel. This is good language practice for me, but I can't believe it is intentional. The Windows 10 Anniversary Update (version 1607), released in July 2016, seems to have fixed this problem for me. Does your MS Word Phonetic Guide fail to automatically generate Pinyin? I have not received complaints about this from Windows 10 users, but in Vista, Win 7, and Win 8 each new system installation often left us with a broken Registry connection between Word and the MSPY Pinyin database. The problem could only be fixed by installing an IME update (or by reinstalling the original IME if it was available separately). At this time I have no fix for this in Windows 10, although I suspect installing the Anniversary Update (version 1607, July 2016) would be the solution. I would like to hear from you if you are experiencing the problem in any Windows 10 release. If you have an older version of Windows, please see the broken Phonetic Guide FAQ page. Feel free to contact me if you have something to add to this list - either a problem or a solution, everything helps - or if you have other comments, questions or suggestions. Windows 10 Help files - in English!